The Hieromartyr Hippolytus, and the Martyrs Censorinus, Sabinus, Chryse the Virgin and 20 Others suffered during the third century. When St Hippolytus, Bishop of Rome, learned of the suffering of the martyrs, he appeared before the governor despite his advanced years and rebuked the torturers for their inhumanity. The enraged governor sentenced the holy bishop to be tortured. After long torments, they tied him hand and foot and threw him into the sea. St Censorinus was a high-ranking magistrate during the reign of the Roman emperor Claudius II (268-270). He was arrested and thrown into prison for his faith in Christ. By the grace of the Lord Jesus Christ he raised up a dead man. As a result, twenty soldiers and prison guards were converted to Christ. They were beheaded with St Censorinus. Then the virgin Chryse was brought for interrogation. She bravely confessed herself a Christian and was subjected to torture. After horrible torments, she was drowned in the sea. Saint Sabinus had heavy rocks tied around his neck, and then they hung his body on a tree and burned his sides with torches. In his torments, he gave up his holy soul to the Lord. With St Chryse suffered the martyrs Ares, Felix, Maximus, Herculianus, Venerius, Stiracius, Mennas, Commodus, Hermes, Maurus, Eusebius, Rusticus, Monagrius, Amandinus, Olympius, Cyprus, Theodore the Tribune, Maximus the Presbyter, Archelaus the Deacon, and Cyriacus the Bishop. All these Roman martyrs suffered in the year 269. The relics of the Hieromartyr Hippolytus were put in the church of the holy Martyrs Laurence and Pope Damasus at Rome. St Hippolytus was a disciple of St Irenaeus, Bishop of Lugdunum (Lyons in France), and he is also renowned as a Christian theologian who wrote many treatises against the heretics. St Hyppolitus compiled a Paschal Canon, the famous Apostolic Tradition, "On Christ", and a "Treatise on the Antichrist." 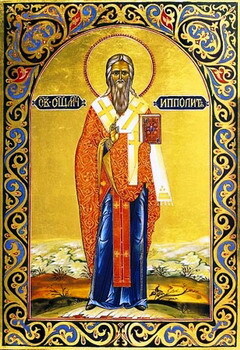 St Hippolytus also wrote many commentaries on Holy Scripture, on the Biblical Books: Genesis, Exodus, Proverbs, Ecclesiastes, the Song of Songs, and on the Gospels of Matthew, Luke and John, and on the Prophets Isaiah, Ezekiel, Daniel, Zechariah, on the Psalms of David and on the Apocalyse. Part of his works are preserved only in fragments. His discourses, devoted to the Theophany and the Prophet Daniel, are preserved in full. His discourses demonstrate his masterful style of preaching. He was one of the last Western Fathers to write in Greek.